Queen Elizabeth has four main dining rooms, an alternative restaurant (The Verandah), a buffet (the Lido) and a speciality option, the theme of which changes every few nights. The main dining room is the lofty, two-tier Britannia Restaurant, where everybody -- except those in Grill cabins and Britannia Club cabins -- dines. Lots of gorgeous Art Deco touches stand out in the curved panels and lavish sconces, as well as a sweeping staircase. There are two seatings, 6 p.m. and 8:30 p.m. Tables are allocated in twos, fours, sixes and eights. Britannia is also open for a full, cooked, waiter-served breakfast (including pancakes, waffles, omelettes and eggs Benedict) from 8 a.m. to 9:30 a.m. on sea days (7:30 a.m. to 9 a.m. on port days) and lunch from 12:30 p.m. to 2 p.m., with open seating at both. There's a wide choice on the dinner menu, including five appetizers, two salads, six entrees (two of which are vegetarian choices) and six desserts, including cheese. Typical dishes include jumbo shrimp with Waldorf salad to start, as well as some adventurous soups. (We tried cheddar cheese soup, which was very tasty.) For mains, favourable options are penne with shrimp and Limoncello, Norwegian salmon, roast turkey or steak Diane. Vegetarian courses are imaginative; millefeuille of leek and asparagus with a Champagne sauce were offered on the night we dined there. Portions aren't huge, though, and some people at our table said their food wasn't piping hot. Vegetarians should note that there's also a dedicated veggie menu available on request with a choice of five appetizers and soups and eight entrees, so coupled with the options on the main menu, it's easy to have a varied and meat-free vacation. Passengers are requested to place orders 24 hours in advance, but it was never a problem when our vegetarian friend placed her order at breakfast. Dishes are well thought out and presented, so much so that several carnivores at the table liked the look of them. Dishes included a Japanese vegetable sushi selection and forest mushroom turnover with Swiss cheese fondue. Desserts include classics like creme brulee, chocolate parfaits and a sugar-free option, as well as some English classics like rhubarb pie. Waiters bring around petits fours after dinner, which is a nice touch. In all the main restaurants, the more healthful dishes are marked "Royal Spa Selections." One step up from Britannia is the Britannia Club, a separate room for the inhabitants of the top-grade Britannia cabins. Small and intimate with a cream and teal colour scheme, this pretty room has windows all along one side and tables for two, four and six. The menu is a tweaked version of what's found in Britannia, and you get a more exclusive atmosphere, with a team of ultra-professional staff who quickly remember your name and personal likes and dislikes. Dinner is open seating from 6:30 p.m. to 9 p.m. Breakfast and lunch are served there, as well. High up on Deck 10 are the two Grill restaurants, in an area accessible only with a special keycard or up a staircase marked "Grill guests only beyond this point." The stairs open onto a landing, off of which are both dining rooms and a cocktail lounge with views down over the pool. Both dining rooms have a chocolate and gold colour scheme and are adorned with ornate, backlit glass panels and flooded with light early evening from windows all along one side. The two Grills share a pretty outdoor terrace, decked out with Italian tiles and a splashing fountain, partly sheltered from the wind by high walls. This terrace, the maitre d' told me, is more popular for lunch than for dinner; being so high on the ship, it is somewhat exposed, and food can chill quickly if the outside temperature is not suitably high. Princess Grill offers a similar menu to the Britannia Restaurant but with more items and a long, always-available a la carte menu. We had double-baked goat cheese souffle and Provencal prawns from the a la carte menu, as well as some excellent cheeses from the trolley. Queens Grill has an even bigger a la carte menu -- essentially, you can have what you like. We saw a succulent-looking beef Wellington whizzing past, as well as lamb being flambeed tableside. This tableside cooking is a real feature of the restaurant, and we succumbed to some superb crepes Suzette for dessert, prepared with incredible panache and confidence. But for really outstanding food, it has to be The Verandah, open 6:30 p.m. to 9 p.m. and for lunch on sea days from 12 p.m. to 1:30 p.m. ($25 for lunch and $35 for dinner.) Located on Deck 2 and available to all cruisers, The Verandah is really special. 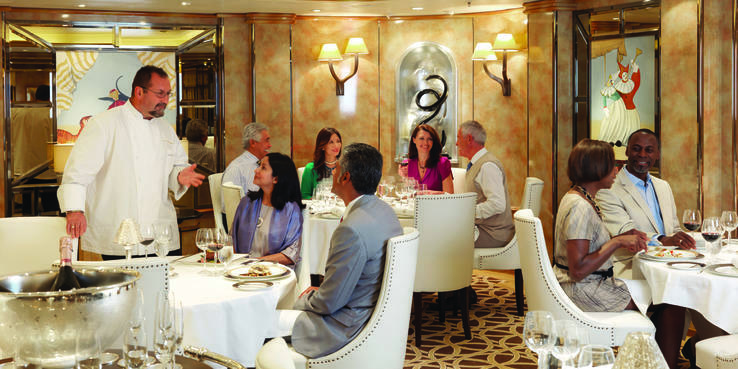 If you want to turn an ordinary cruise into a luxury cruise, dine in there. And check out the coveted white leather chairs, too. You won't believe your eyes with some of the little touches. When a couple of people at the table said they were finding it hard to read the menu under the low lighting, a waiter was at the table within seconds with an elegant wooden box. Inside were neatly stacked pairs of reading glasses of varying strengths, and he also offered an illuminated magnifying glass. We had a crabmeat starter on a seafood foam sauce with tomato caviar and little cubes of feta cheese, which was exquisite. Our main was sea bass with a mushroom crust on a watercress sauce, one of the most melt-in-the-mouth pieces of bass I've ever tasted. An amuse bouche and a sharp lemon sorbet also arrived, and the cheese trolley had some fine French cheeses. There's a five-course tasting menu, too, designed to be taken by the whole table, priced at $35. Service was attentive and unobtrusive -- and gratuities are included in the price of each dish, so there is no need to budget for an additional tip. There's an extensive and impressive wine list in all dining venues, featuring a decent range of wines in the $30 to $40 bracket, right up to the big hitters like Chateau Lafite Rothschild for $1,350 and Petrus Pomerol at $2,500. A soft-drink package is available for $4.95 per day, but it only includes sodas and some juices -- not mineral water. The 24-hour casual dining venue is the Lido on Deck 9. Breakfast is from 4 a.m. to 11:30 a.m., followed immediately by lunch until 3 p.m., afternoon tea until 6 p.m. and dinner from 6 p.m. to 11 p.m., with snacks available through the night. The Lido was our least-favourite space on the ship. We didn't find the layout particularly user-friendly; it took a while to work out where everything was and to note the fact that some counters are duplicated. The waiters didn't seem to do much. They certainly weren't helping passengers or fetching drinks. Long queues form at breakfast for the hot choices as people shuffle along with trays. Putting the ketchup at the end of the line, rather than on the tables, slows things down further. The variety, however, is wide -- eggs (to order if you want), bacon (English and crispy American), sausages, baked beans, fried potatoes and mushrooms are available every day. There's a big pastry section, as well as cereals. Coffee and juice come out of machines, which also attract long queues. Lunchtime has a pizza and pasta station, a sandwich station, a salad bar, a dessert bar and hot choices like grilled sole, steak, French fries and traditional English dishes. Roasts, hotpots and meat pies are also options. The salad bar wasn't extensive, although the selection of cheese and cold cuts was reasonable. When we got back late from a foray ashore, everything had closed down, except for the most basic of salad offerings, but the sandwich station chef obligingly boosted our dull lettuce-and-tomato combo with smoked salmon and chicken mayonnaise. On the last day, despite everything on offer, we really craved a simple baked potato but couldn't find one. Within minutes, the chef duly produced one. In the evenings, one side of the Lido becomes waiter-service with a theme, which changes every three days or so (open 6:30 p.m. to 9 p.m.). Current themes include Aztec (Mexican), Jasmine (pan-Asian) and Indian. The cover charge is $17.50. Several passengers questioned the point of paying extra to dine in the Lido, but the sectioned-off area takes on a completely different guise for these themed evenings. Aztec was on during our mini-cruise and turned out to be a superb meal and an amazing value. The tables had been done out with candles and little cactus decorations. Margarita shots arrived, followed by a nicely presented platter of four spicy starters. There's a choice of mains -- we had pancakes stuffed with spicy shrimp -- and another platter of desserts, including Mexican doughnuts with different sweet and spicy dips. We could barely move afterward. There's an option with each theme to pay $25 (including the $10 cover charge) for a wine pairing, and our travel companion chose this, which, for Aztec, included an excellent white, a red and a dessert wine. There are other dining venues dotted around, too. The pretty Cafe Carinthia on Deck 3, open from 7 a.m., serves pastries for breakfast, quiches and salads at lunchtime and afternoon tea. Speciality coffees and teas cost from $2, and there are liqueur coffees and some coffee-themed cocktails. Afternoon tea is served in the Lido and the Queens Room -- waiter-served tea and crustless sandwiches, as well as a selection of cakes and hot scones with whipped cream (not clotted cream, note) and jam -- the same in both venues. Once a week, a full-scale Champagne tea is served in the Garden Lounge for a "nominal charge" of $26.50 per person (including gratuity), for which you get a glass of Laurent Perrier and Twinings tea, as well as a more tempting array of cakes. The British-themed Golden Lion pub also serves free pub lunches, featuring staples like bangers (sausages) and mash, fish and chips, cottage pie and ploughman's lunches (a platter of cold meats and cheese served with bread and pickles), as well as (free) evening meals including garlic rope-grown mussels, sticky sesame-crusted Norfolk duckling drumsticks, mac 'n' cheese, tandoori spiced Dorset lamb shank, burgers, scampi, squid and Scotch eggs. Room service has the usual comfort food: club sandwiches, pasta, burgers and so on, as well as the menu from the dining rooms if you want to dine in your cabin in the evening. There's no charge. We had hot room service breakfast, which arrived promptly and was nicely presented, and for lunch the balcony table and chairs were adequate for outdoor dining. It's also worth noting that passengers can bring one bottle of wine or Champagne onboard, but don't expect to start bringing on larger quantities unless it's approved by Cunard prior to the voyage. A $20-per-bottle corkage fee applies for wine brought onboard and consumed in the restaurants.